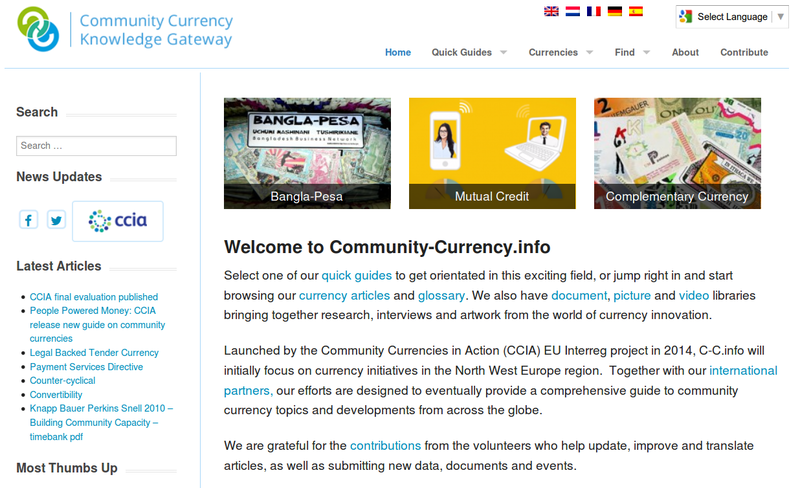 The Community Currency Knowledge Gateway was build for the Community Currencies in Action (CCIA) project. As the project manager of CCIA for the New Economics Foundation, I developed the strategy, content architecture and layout of the website, procured and liaised with the web-developers (WordPress with WPML) and authored and edited large parts of the initial content of the site in 2013 and 2014. Currently focused on North West Europe but aiming for global coverage, the gateway outlines the origins, aims, vocabulary and functions of both high-profile and lesser-known projects in the growing world of complementary currencies and currency design. Offering extensive information on alternative currency systems, key institutions and individuals, the site also contains video, picture and document libraries as well as a set of practical tool–kits designed to help new projects get off the ground. Quick guides for researchers, policy–makers, practitioners and small businesses provide customised guidance through this expanding field and link the most relevant elements of our website. With the site using a wiki structure people from around the world can share their knowledge. Click here to help!